Editor’s note: This story originally published in 2017. Take a look back at our 10th Kaboom! build in Kinston, North Carolina with chef Vivian Howard. About nine months ago, days after Hurricane Matthew tore through Eastern North Carolina, more than 200 Kinston residents packed sandbags in Pearson Park, right on the edge of downtown. The Neuse River – so close to the park that even at a normal level you can see it through the trees – was expected to flood. Families, business owners, Boy Scouts and Girl Scouts, and even the mayor packed sandbags to protect Kinston’s homes and businesses from the impending flood waters. The storm came and went, but for Kinston, the recovery continues. On June 22, more than 100 employee volunteers from Blue Cross and Blue Shield of North Carolina (Blue Cross NC), along with nearly 100 more community volunteers, gave the recovery effort a big boost by transforming an area of that same park into a beautiful and accessible playground. “Our kids deserve this,” said Kinston Mayor BJ Murphy. Kinston, a town of about 21,000 residents, is no stranger to the type of flooding they saw last October. In 1996, Hurricane Fran caused extensive damage to the area, flooding the Neuse and forcing hundreds to flee their homes. The flooding in 1996 was classified as a “500-year flood,” which means they shouldn’t have expected to see anything like that again for centuries. But despite all of the hardship this community has endured over the decades with hurricanes and economic struggles, Kinston has always bounced back. It’s also a town that is experiencing a “renaissance” (the mayor’s word choice) of its downtown, with several new restaurants and storefronts. And it’s home to Vivian Howard, award-winning chef, star of the PBS documentary series A Chef’s Life, and owner of two Kinston restaurants. 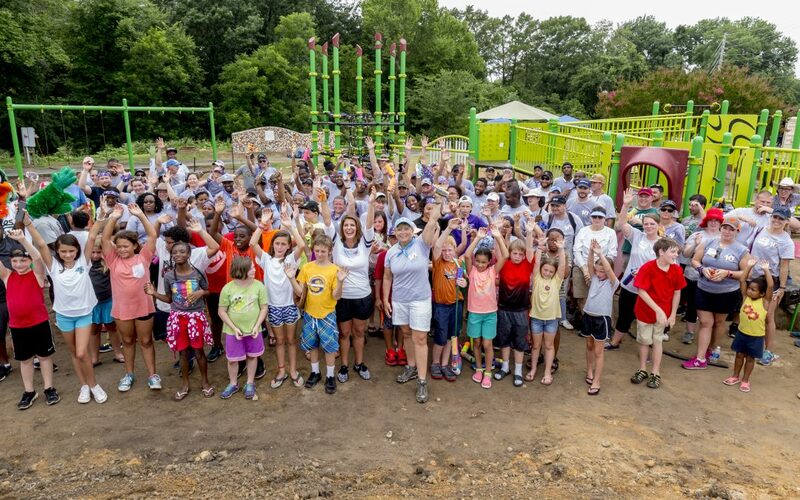 This was the tenth playground Blue Cross NC has built in partnership with KaBOOM!, a national nonprofit dedicated to giving all kids the childhood they deserve, filled with balanced and active play, so they can thrive. Kristy Kent, a member of Blue Cross NC’s community relations team, has managed all ten of those KaBOOM! builds. “In total, we’ve provided ten unique play spaces for more than 16,000 children and their families across the state,” she said. “Each of the playgrounds reflect our community partner’s vision for their space. What I love the most about these playground builds is that we come to these communities and work alongside them for a short while. And then we leave a part of ourselves there with them,” said Kristy. This one was special not only because the tenth playground build was a milestone, but also because it’s a modern and accessible playground, built for all children of all needs and abilities. There are accessible swings, a collection of musical instrument play pieces designed for children with sensory challenges, and ramps leading up to each level of the main play structure. And much more. Also, the “floor” of the play area is covered in a special wheelchair-friendly surface. There is gathering space for families to sit and have a picnic, or listen to the live music that plays in Pearson Park every Thursday afternoon. And perhaps the most interesting part of the playground is a huge dragon slide, which would make any child feel like they’ve stepped into a fairy tale. The fame of Vivian Howard and her restaurants, along with other downtown establishments, has brought people come from all over the country – and even the world – to Kinston. “I never would have thought I’d see 500 people in downtown Kinston at night,” said lifelong resident Bill Ellis. And Mayor BJ Murphy noted that a couple from France checked into the Mother Earth Motor Lodge the other night. Howard’s office sits right across from Pearson Park, and she’ll have a daily view of the new playground. Her six-year-old twins will likely play on the Loch-Neuse Monster. “Playgrounds are places where kids who are not in the same ‘socioeconomic stratosphere’ can mingle and play,” she said. It’s true – play is what all kids have in common, and it’s crucial to their physical and social development. That’s why KaBOOM! exists, and why Blue Cross NC funds playgrounds. “Children can learn the habits of accepting others from an early age, and playgrounds can be like a classroom for that. I’m excited for my kids and for all of the children who will be using this playground,” Howard said. After hours of mixing cement, putting together a mosaic wall, landscaping, and piecing together playground equipment, you’d expect the volunteers that day to be completely exhausted and itching to get into their air-conditioned cars for the ride home. But sore muscles and thick humidity did not dampen their enthusiasm. They all had smiles and cheers when a group of a few dozen local children cut the ribbon to officially open the new playground. Maggie Brown is an internal communications specialist at BCBSNC, focusing on spreading the company’s news to its 4,500 employees. What Maggie loves most about her job is connecting with employees and sharing their remarkable stories.